Can a whole house really be built in 2 ½ days? What if half of the builders are elementary-aged children? What if most of the adult builders don’t have much construction experience? Impossible? Not if you were the 2018 King’s Elementary “La Casa de Amor” team! 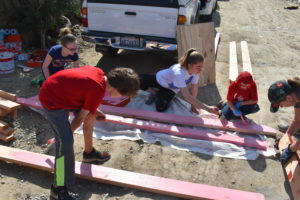 10 adults and 11 children traveled from Seattle to Antorchista, Tijuana for part of their spring break to build a house for the Moreno family: Edwin, Erika, Jesus, Mailin and Liset. It all started with some pennies…..
For the months of February and March, King’s Elementary students brought coins and bills to school every morning. All of these donations helped to purchase the building materials for the Moreno’s house. 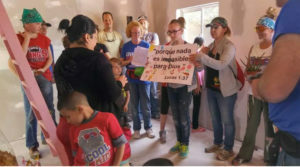 Also, the younger students decorated posters and bookmarks with Spanish scripture verses to be given to the Morenos and their neighbors. The older students wrote prayers, encouraging words, and Scripture verses – all translated into Spanish – onto notecards for the Moreno family. Every King’s Elementary student participated! Early in the morning on April 2nd, the La Casa team – 6 families from King’s Elementary – met at SeaTac Airport. They flew to San Diego, CA, picked up rental vans, and headed to Costco, Walmart, and Home Depot to pick up food and supplies. Then, they met up with Paul (a.k.a. “Pablo”) from Baja Christian Ministries to cross the border into Mexico. 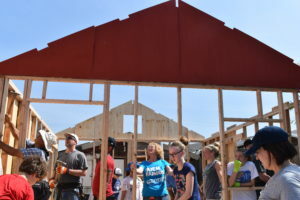 There was plenty of time to go visit the family who had received a home last year, go pray over the Moreno family building site, and then check into the hotel to get a good night’s sleep in preparation for building the next day. On April 3rd, Pablo met the King’s Elementary team at their hotel and led them out to the Moreno family building site. 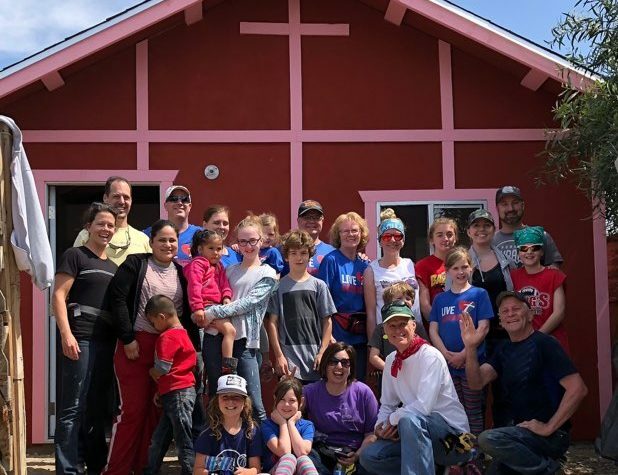 Baja Christian Ministries (BCM) has built over 2300 homes in Tijuana over the past 25+ years!! To say “they know what they’re doing” is a gross understatement. 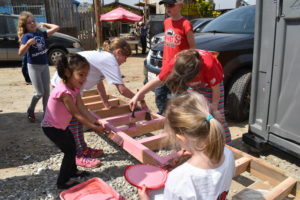 From the moment the King’s Elementary team opened their car doors that morning, to the moment they packed up to head back to their hotel for dinner, Pablo and “Hallelujah Hector” from BCM kept everyone busy with painting, hammering, sawing, roofing, cleaning, and laughing. 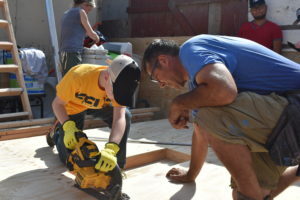 By the end of Building Day 1, the walls and roof were up, and even some of the interior dry wall was up, taped, and mudded (dad, Edwin Moreno, helped a lot with the mudding when he wasn’t at work)! 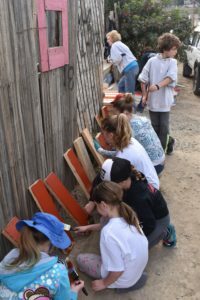 Most of the exterior plywood boards were painted prior to being put on the house, and the boards were still wet with paint when they were put up! Everyone was thrilled with the progress! For Building Day 2, the team was already working on finishing-type work. 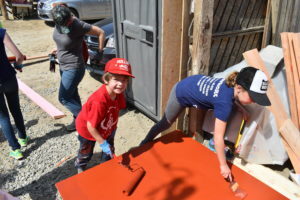 All of the trim boards were being painted (4-year-old, Mailin Moreno, really enjoyed helping to paint), all of the interior dry-walled walls were getting their 2nd coat of mud, the windows and doors were going in…. 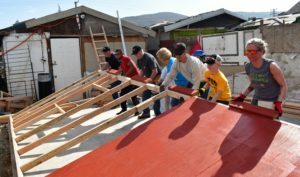 By lunch time they were done with what could be worked on that day, so the King’s Elementary team went with several other members of Baja Christian Ministries to another location in Tijuana. There they went door-to-door and invited families to the nearby park for some free gifts and activities. At the park, BCM staff and King’s Elementary team members shared testimonies of God’s faithfulness and also extended an invitation for people to ask for prayer. Bibles, study guides, bubbles, soccer balls, and coloring books were all given out. The team enjoyed staying in the park, praying for families, and playing with the neighborhood children, until it was time to head back to the hotel for dinner. Building Day 3 was spent doing all of the finishing touches on the Moreno’s house. By early afternoon the team gave Erika her new keys, a leather Bible, and a few house-warming gifts. They prayed over the Moreno family, their new home, and the neighborhood. With the extra time they had, the team walked around the neighborhood giving out little toys to the children, and smiles and hugs to everyone. By the time they walked back to the building site to get into their cars to head back for dinner, the Morenos were already painting the interior of their new house! What a thrilling sight! 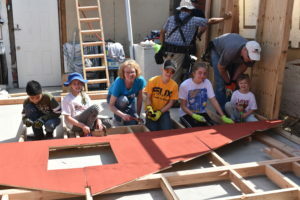 Can a house really be built in 2 ½ days with an inexperienced construction crew, half of whom are children? When God is in charge, the answer is YES! Rachel White has been teaching 2nd grade at King’s Elementary since 2005. She and her husband live in Edmonds with their twin 18-year-old daughters. 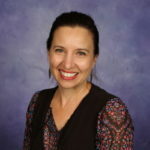 She has a BA in Mathematics with a minor in Cross-Cultural Communication and a MEd in Curriculum and Instruction, all degrees from Seattle Pacific University.